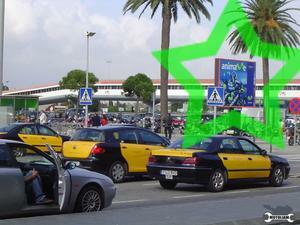 I arrived in BCN two hours late and immediately noticed the Moto Ad at the airport. These signs are everywhere in the cities. I managed to fly through Amsterdam, but didn't have time to leave the airport and try the brownies. This was my first taste of European air, and I was raring to go! I hopped in one of these cabs and made my way to my apt., where I was to meet my new roomates for the first time.